Why do Hospital Pharmacies use Sterile, Tamper Evident Port Seals on IV Containers and Drug Vials? Winfield laboratories surveyed attendees at both the 2009 American Society of Health System Pharmacists (ASHP) Summer Meeting in Chicago and the 2009 Pharmacy Purchasing Network Conference (PPN), held in Las Vegas. While not undertaken as a scientific survey, we believe that this collection of almost 200 responses is indicative of current hospital pharmacy practices in the use of sterile, tamper evident port seals. Over 90% of the attendees surveyed reported that they currently use sterile, tamper evident port seals as part of their in-hospital pharmacy protocol, when compounding and/or dispensing drugs. Verify that drugs (and their containers; bag, vial, tube, etc.) had been fully processed through the hospital pharmacy before being delivered to the patient care floor (including correct dosing, patient labeling and billing/charge information). 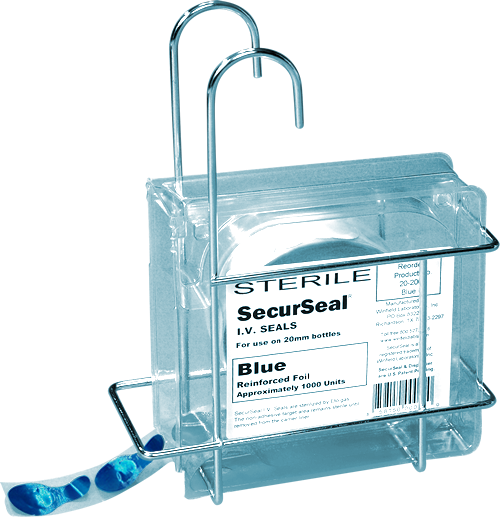 It was often noted that this use of sterile, tamper evident, SecureSeal® IV Seals is particularly helpful in the safe and efficient management of USP <797> sterile drug compounding – including being an important added precaution against inadvertent double dosing of an IV bag. Other responses fell into one of three general categories, listed below in the order of most to least frequent mentioned. 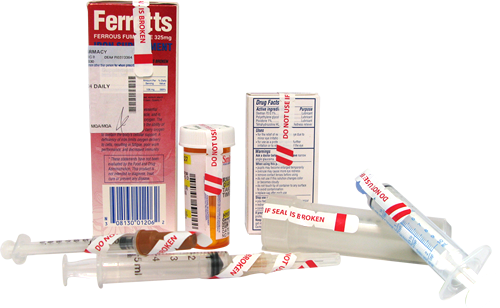 The use of sterile, tamper evident IV and vial port seals of different colors to identify different types of drug that require special handling or management. For example, putting RED seals on all narcotics and YELLOW seals on all chemotherapy drugs that leave the hospital pharmacy for the patient care areas. Sterile, tamper evident, port/closure seals are used to confirm the integrity of unopened / unused drugs that are ordered and sent to the patient area. This is also important if the drug is not administered and returned to the hospital pharmacy – e.g., change in Doctor’s orders, patient discharge, etc. Different color seals are used to help in the management of pharmacy inventory. For example, a different color sterile, tamper evident port seal is used to designate the day of the week that a drug / container was compounded / processed. The SecurSeal® clear plastic dispenser box is IPA ‘wipe-down’ compatible and the product has zero paper & zero cardboard (even the box label is vinyl – not paper)!